The science of climate change. What we know and how we know it. We believe that human activity is changing the planet, and were originally founded to drive action on the complex issues that lead to climate change... including the role of fossil fuels, cradle to grave production, over-consumption, poor product/business design, deforestation, toxification, etc. While the climate and our impact on it is difficult to model, we are concerned about misinformation and doubts regarding the underlying threat and causes of climate change. The following is a brief summary of the science, based primarily on "Climate Change 2013: The Physical Science Basis. Contribution of Working Group I to the Fifth Assessment Report of the Intergovernmental Panel on Climate Change (IPCC)". All of the underlying documents are available at the IPCC website. Direct citations from the report are in "quotes". Additional information is available from the report Climate change evidence and causes-an overview from the Royal Society and the US National Academy of Sciences. Please feel free to pass this summary on. We have not yet seen the more dramatic changes resulting from warming, which has led many to complacency. Like a tsunami, we may not recognize the threat until it is on top of us. The truth is out there. Conclusions about climate change are based on science. "The Intergovernmental Panel of Climate Change is the leading body for the assessment of climate change, established by the United Nations Environment Programme (UNEP) and the World Meteorological Organization (WMO) to provide the world with a clear scientific view on the current state of climate change and its potential environmental and socio-economic consequences. The IPCC is a scientific body. It reviews and assesses the most recent scientific, technical and socio-economic information produced worldwide relevant to the understanding of climate change. It does not conduct any research nor does it monitor climate related data or parameters. 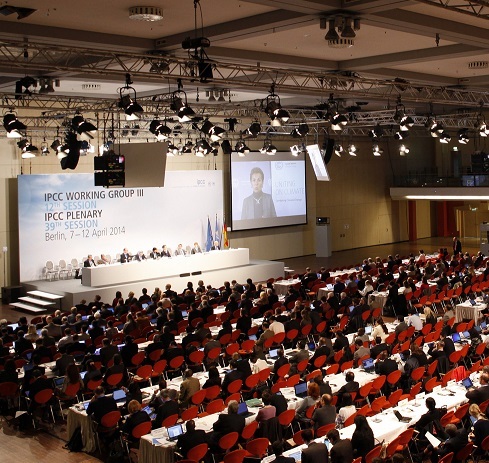 Thousands of scientists from all over the world contribute to the work of the IPCC on a voluntary basis. Review is an essential part of the IPCC process, to ensure an objective and complete assessment of current information. Differing viewpoints existing within the scientific community are reflected in the IPCC reports. Because of its scientific and intergovernmental nature, the IPCC embodies a unique opportunity to provide rigorous and balanced scientific information to decision makers." "Global atmospheric concentrations of carbon dioxide, methane and nitrous oxide have increased markedly as a result of human activities since 1750 and now far exceed pre-industrial values determined from ice cores spanning many thousands of years. 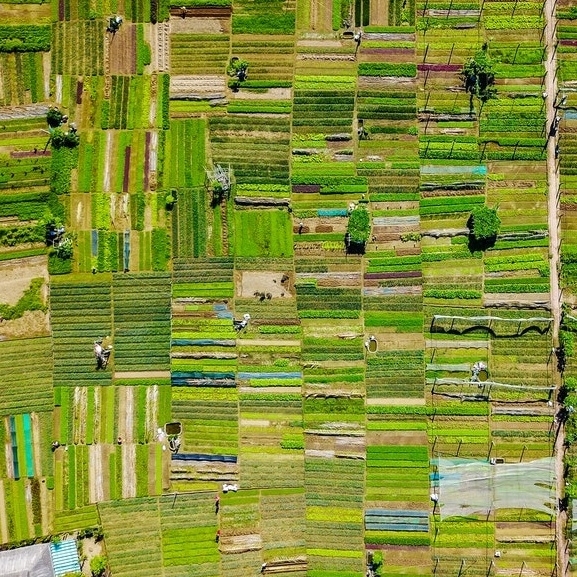 The global increases in carbon dioxide concentration are due primarily to fossil fuel use and land use change, while those of methane and nitrous oxide are primarily due to agriculture. The IPCC has a very high confidence (representing at least a 9 out of 10 chance of being correct) in this conclusion." An IPCC chart showing the increase in these gasses is available here. The radiant forces of increased GHG is warming the planet. 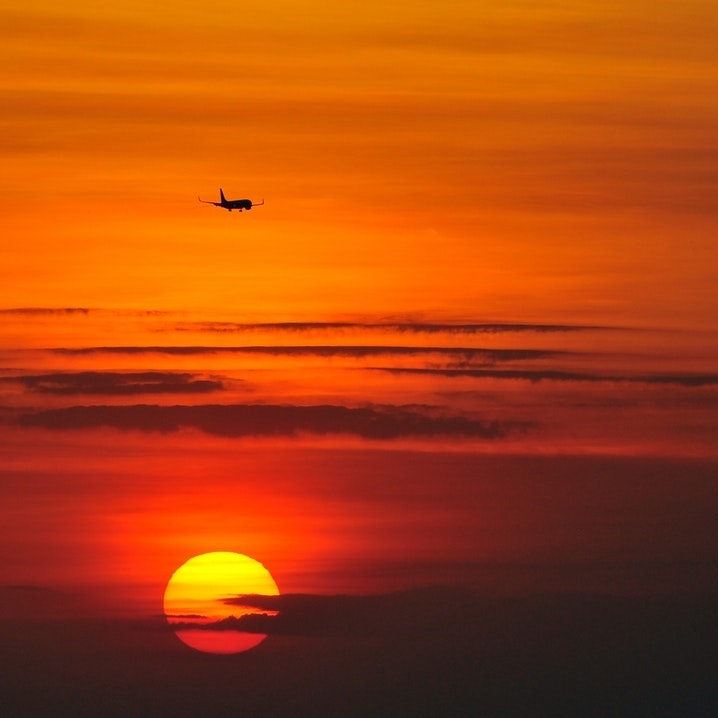 "A warming of the climate system is unequivocal, as is now evident from observations of increases in global average air and ocean temperatures, widespread melting of snow and ice, and rising global average sea level. At continental, regional and ocean basin scales, numerous long-term changes in climate have been observed. These include changes in arctic temperatures and ice, widespread changes in precipitation amounts, ocean salinity, wind patterns and aspects of extreme weather including droughts, heavy precipitation, heat waves and the intensity of tropical cyclones. Most of the observed increase in global average temperatures since the mid-20th century is very likely due to the observed increase in anthropogenic greenhouse gas concentrations. Discernible human influences now extend to other aspects of climate, including ocean warming, continental-average temperatures, temperature extremes and wind patterns." An IPCC chart showing the impact on temperature is available here. This warming will continue, and will have severe consequences. "For the next two decades, a warming of about 0.2°C per decade is projected for a range of emission scenarios. Even if the concentrations of all greenhouse gases and aerosols had been kept constant at year 2000 levels, a further warming of about 0.1°C per decade would be expected Continued greenhouse gas emissions at or above current rates would cause further warming and induce many changes in the global climate system during the 21st century that would very likely be larger than those observed during the 20th century." An IPCC chart showing the forecasts is available here. 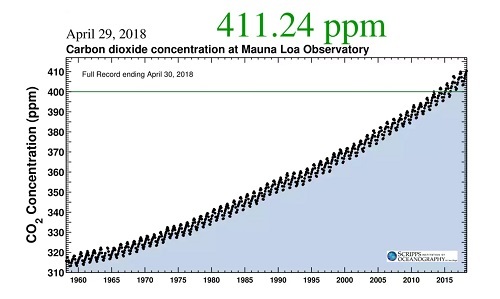 A few words about the Keeling Curve. Don't some scientists disagree about Climate Change? Yes, some do. Just as some scientists disagree about evolution, and about the health effects of tobacco. A minority report released to the Senate Environment and Public Works Committee listed 700 scientists who disagree. But a recent study of 12,000 peer reviewed papers in Journal of Environmental Research Letters found that 97% endorsed the consensus position that humans are causing global warming. Additionally, a survey study of several thousand leading scientists conducted by the University of Illinois found that 82% believe that human activity has been a significant factor in changing mean global temperatures. Climatologists who are active in research showed the strongest consensus on the causes of global warming, with 97 percent agreeing humans play a role. Petroleum geologists and meteorologists were among the biggest doubters, with only 47 and 64 percent respectively believing in human involvement. Many listed in the minority report are meteorologists and petroleum geologists. The survey study concluded that, "The more you know about the field of climate science, the more you're likely to believe in global warming and humankind's contribution to it." The study also concluded that "the debate on the authenticity of global warming and the role played by human activity is largely nonexistent among those who understand the nuances and scientific basis of long-term climate processes. The challenge now is how to effectively communicate this to policy makers and to a public that continues to mistakenly perceive debate among scientists."